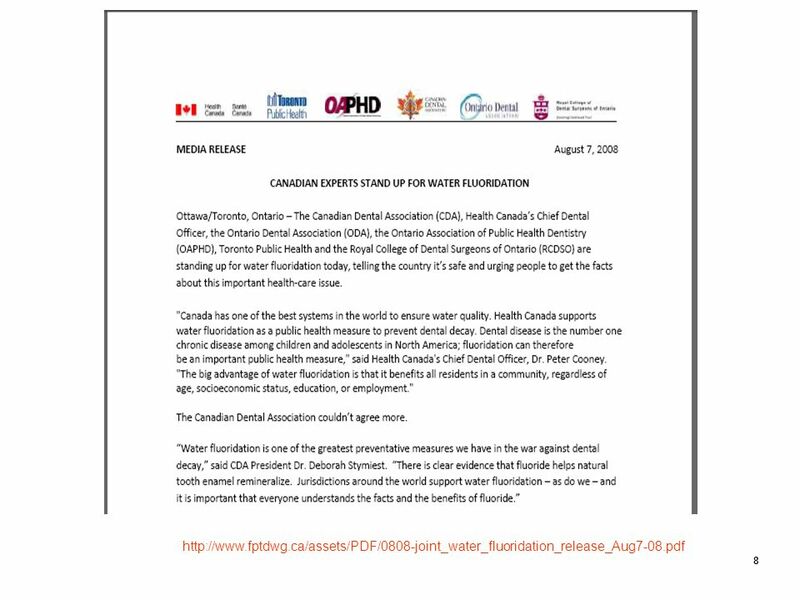 2 Health Canada’s Involvement to date. 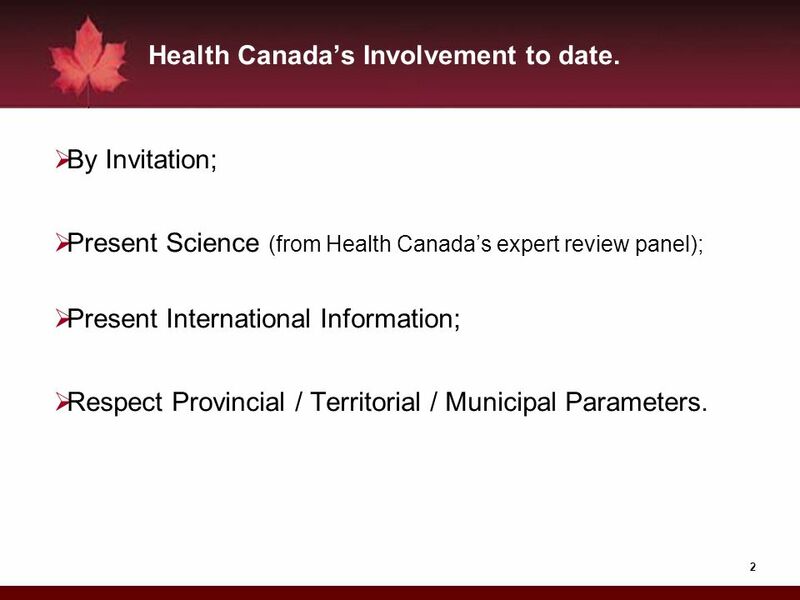 By Invitation; Present Science (from Health Canada’s expert review panel); Present International Information; Respect Provincial / Territorial / Municipal Parameters. Dental disease is: the #1 chronic disease in children & adolescents; (U.S. 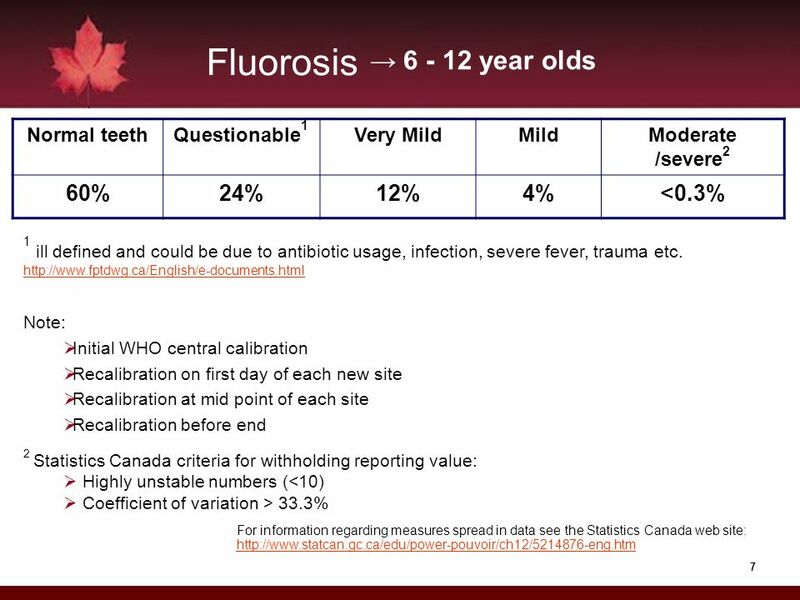 Surgeon General’s Report, May 2000) five (5) times more common than asthma; one of the main reasons preschool children receive a general anaesthetic; the second most expensive disease category in Canada; 47% of Canadians have had dental disease by 6 years of age, 96% have had it in their lifetime. Oral health is linked to a number of systemic diseases. 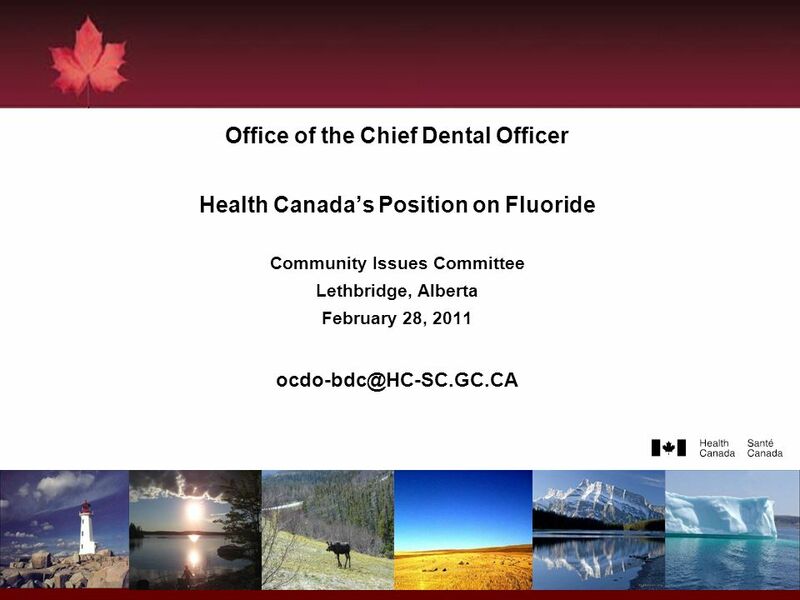 As part of normal activities to update drinking water guidelines, in Spring 2006, Health Canada (HC) initiated a review of fluoride. 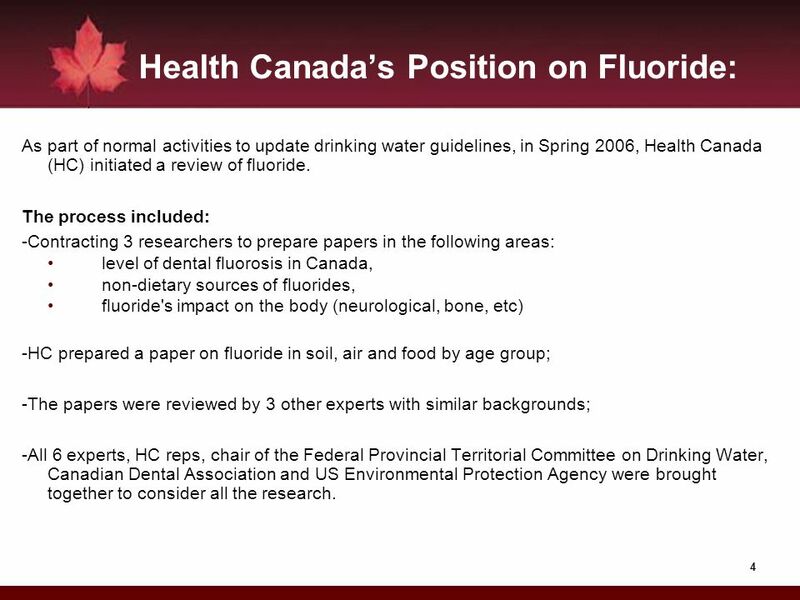 The process included: -Contracting 3 researchers to prepare papers in the following areas: level of dental fluorosis in Canada, non-dietary sources of fluorides, fluoride's impact on the body (neurological, bone, etc) -HC prepared a paper on fluoride in soil, air and food by age group; -The papers were reviewed by 3 other experts with similar backgrounds; -All 6 experts, HC reps, chair of the Federal Provincial Territorial Committee on Drinking Water, Canadian Dental Association and US Environmental Protection Agency were brought together to consider all the research. 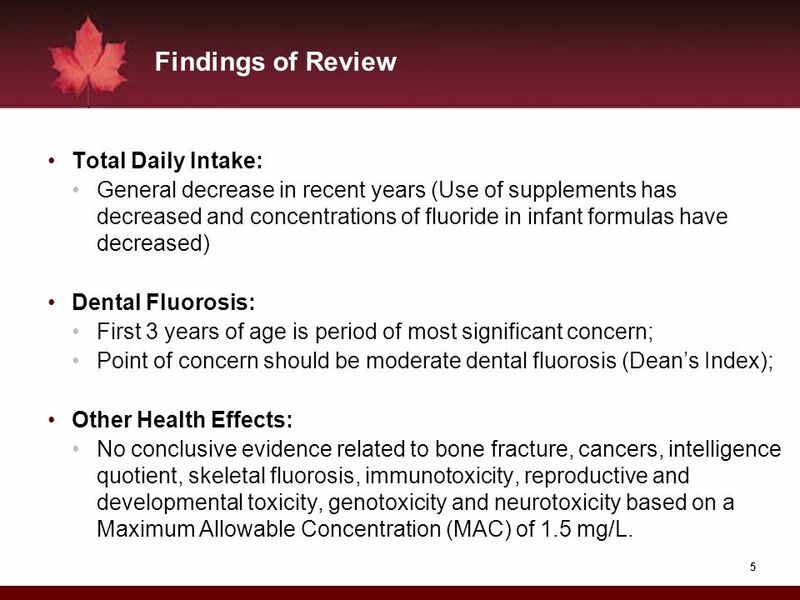 General decrease in recent years (Use of supplements has decreased and concentrations of fluoride in infant formulas have decreased) Dental Fluorosis: First 3 years of age is period of most significant concern; Point of concern should be moderate dental fluorosis (Dean’s Index); Other Health Effects: No conclusive evidence related to bone fracture, cancers, intelligence quotient, skeletal fluorosis, immunotoxicity, reproductive and developmental toxicity, genotoxicity and neurotoxicity based on a Maximum Allowable Concentration (MAC) of 1.5 mg/L. 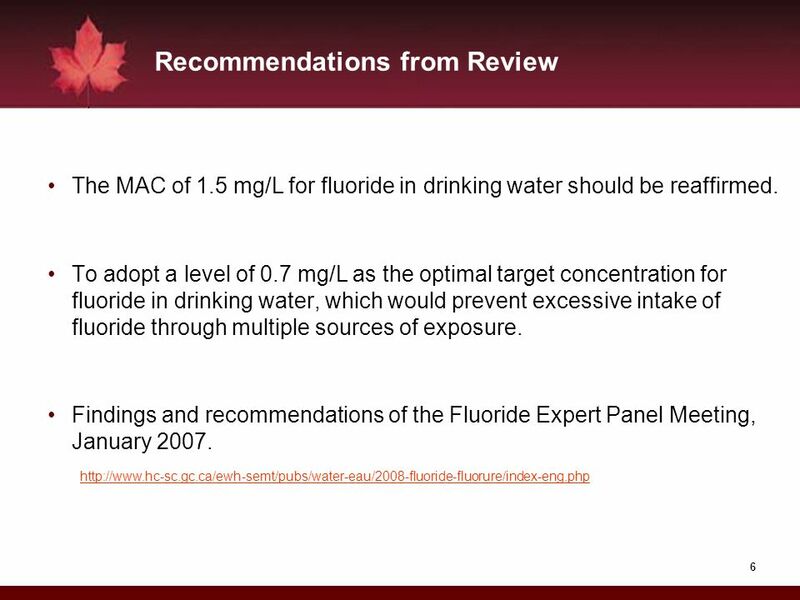 The MAC of 1.5 mg/L for fluoride in drinking water should be reaffirmed. 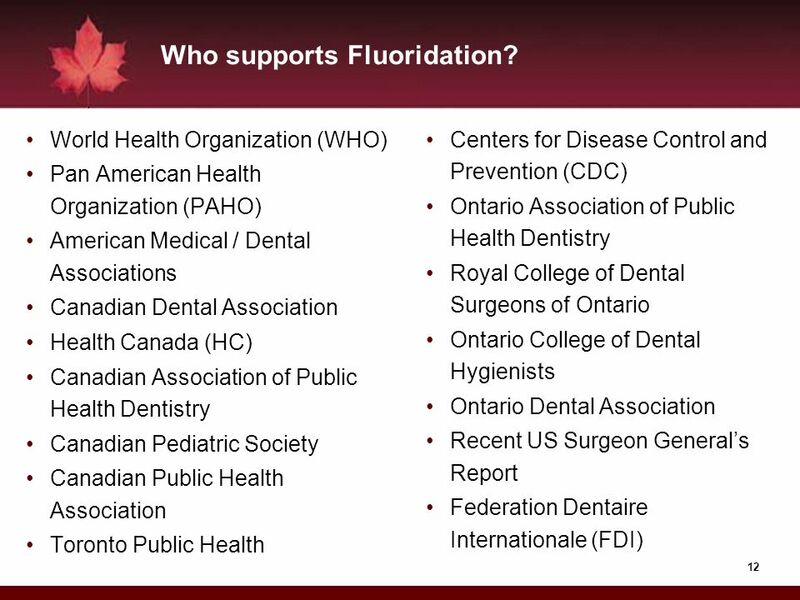 To adopt a level of 0.7 mg/L as the optimal target concentration for fluoride in drinking water, which would prevent excessive intake of fluoride through multiple sources of exposure. 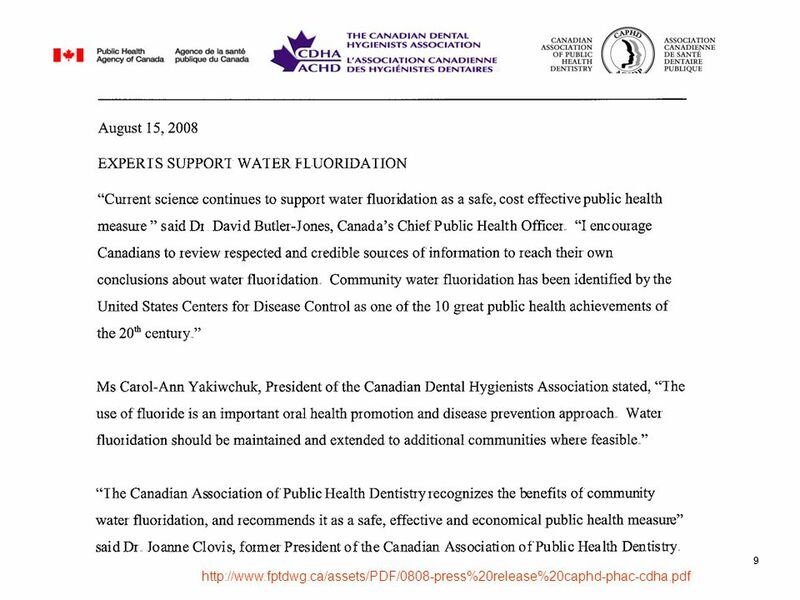 Findings and recommendations of the Fluoride Expert Panel Meeting, January 2007. 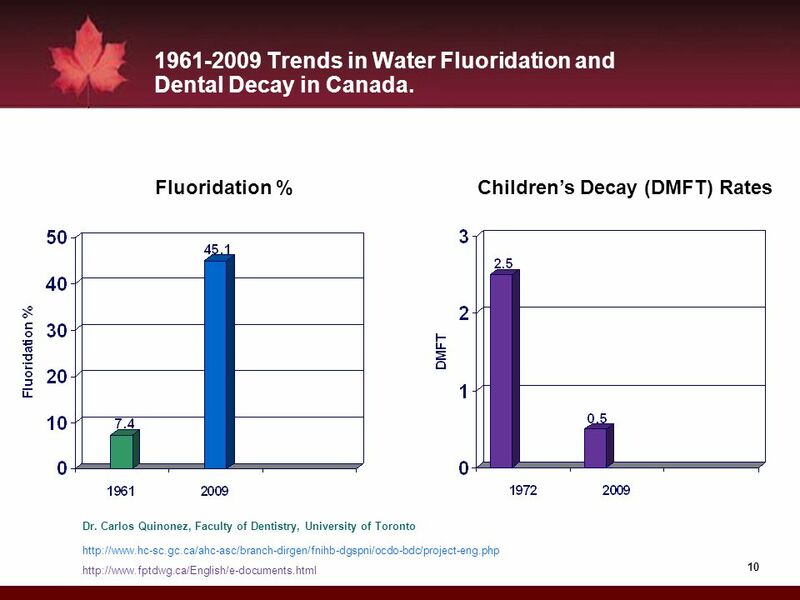 10 1961-2009 Trends in Water Fluoridation and Dental Decay in Canada. 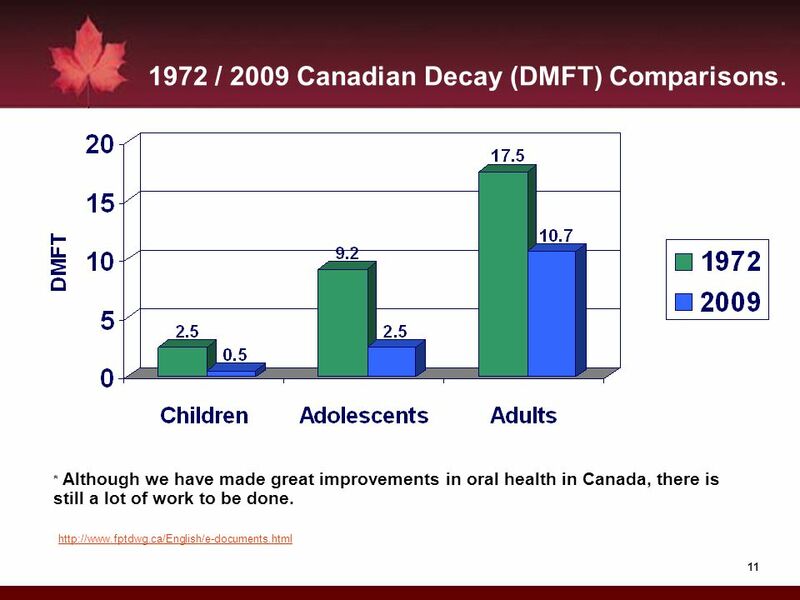 11 1972 / 2009 Canadian Decay (DMFT) Comparisons. 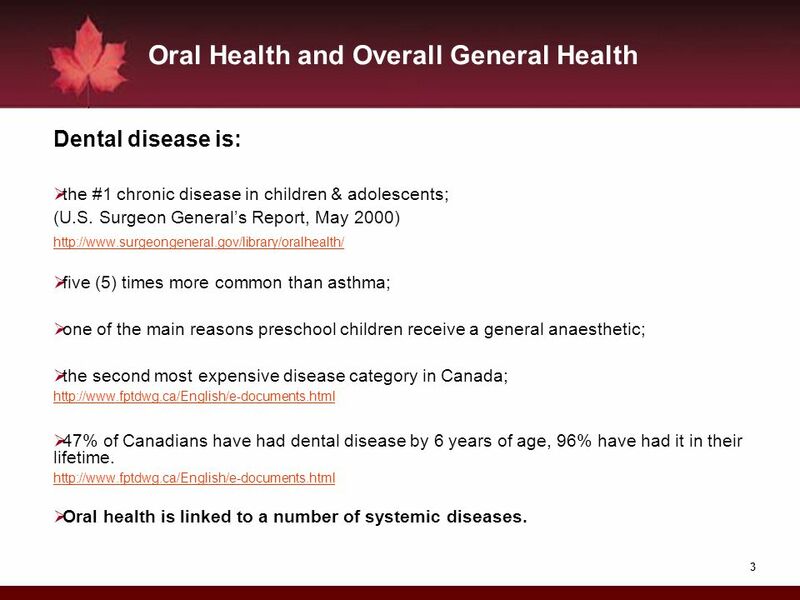 * Although we have made great improvements in oral health in Canada, there is still a lot of work to be done. 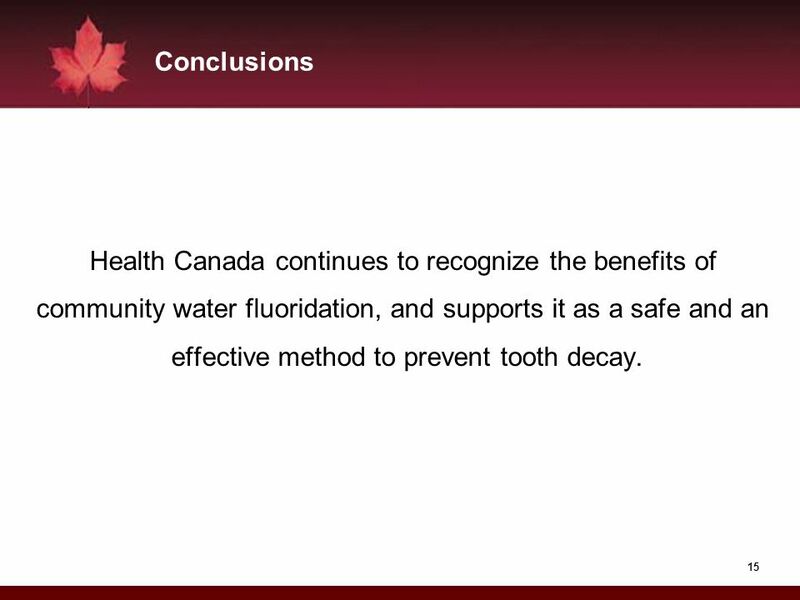 Conclusions Health Canada continues to recognize the benefits of community water fluoridation, and supports it as a safe and an effective method to prevent tooth decay. 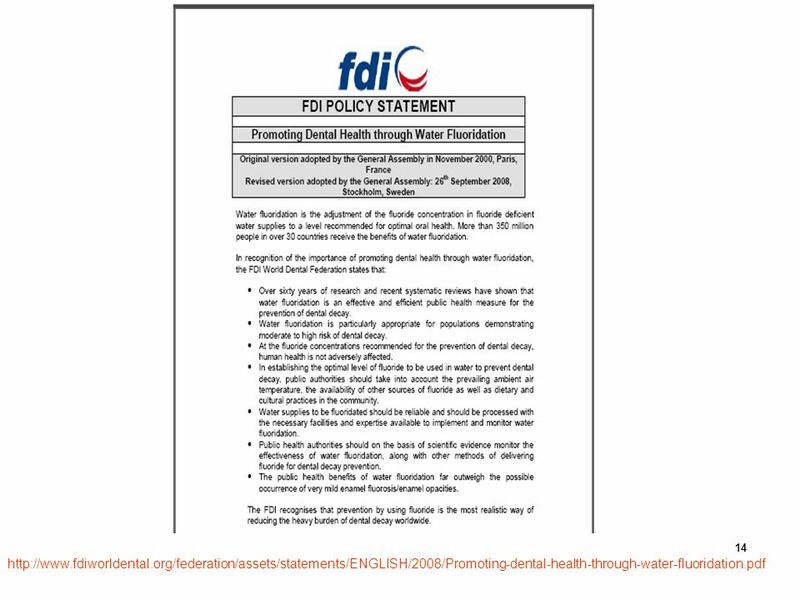 Download ppt "Office of the Chief Dental Officer"
2011 Guidelines for Field Triage of Injured Patients. 1 Industry Brief Apr Outline How is Alberta preparing? How is Alberta preparing? Albertas Health Response Albertas Health Response Albertas Operational. Risk Analysis The Fundamentals and Applications K. Subramaniam, Lecturer (Envt.Health) & Safety Faculty of Health Science, UiTM Jpuncak Alam. January OLA Super Conference 2009 S.Giles, D.Jakubek Ryerson University Census? Statistics? E-Stat can give you the answers! Ontario Library Association. Pandemic Preparedness Considering the Needs of Employees with Disabilities During a Pandemic Flu Outbreak Job Accommodation Network 2009/2010 Webcast Series. 1 Environmental Assessment of Trade Negotiations Government of Canada Approach WTO Public Forum September 25, 2006. Technologys Role in Emergency Management 24 February 2012. OFFICE OF SUPERINTENDENT OF PUBLIC INSTRUCTION Common Core State Standards Initiative Information Shared by the Office of Superintendent of Public Instruction. The California Global Warming Solutions Act of 2006 (AB32) The California Global Warming Solutions Act of 2006 (AB32) California Council on Science and. 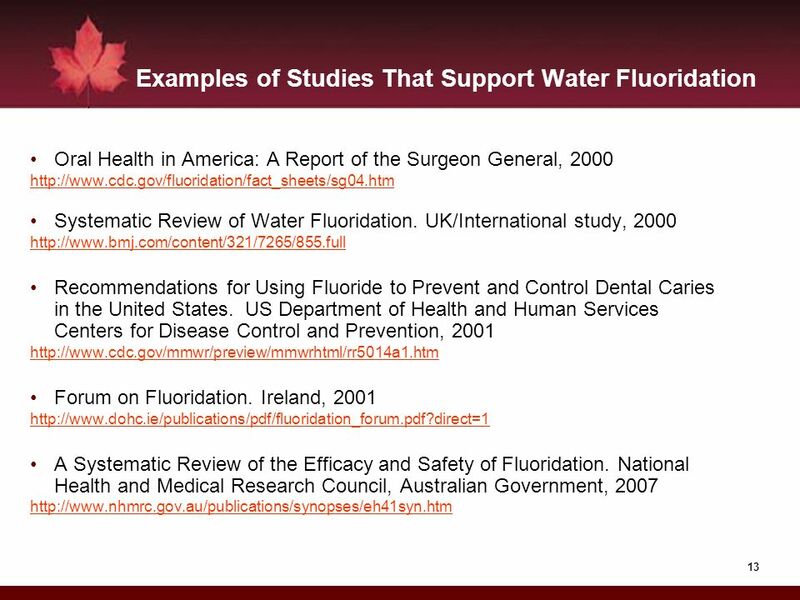 Muddy waters: the use and abuse of findings from the 'York Review' on fluoridation Paul Wilson.